Two and a Half Canadians in Cambridge: Plan: Fail. Hawkeye has a pretty sweet gig here in Cambreej - his lab has no set start-time, or set lunch-time, or set home-time. And there's no one checking his hours, making sure he gets 8 hours of actual work done per day. Except for him. Matthew has an incredible sense of duty and a strong work ethic. What a guy. So it follows that if he gets into work early, he can leave early. This is really important to Matthew, because the good part of Elizabeth's day is over by about 6:45pm. After that, she starts winding down and her mood can be unpredictable, especially now that she's trying to drop a nap, but isn't quite ready for only one nap per day. So Hawkeye likes to leave work at about 5, so he gets at least a happy hour with Eliz in the evenings. Usually, we get up when Elizabeth wakes up - and she is usually a little alarm clock, and wakes up between 7 and 7:30 every morning. So normally we get up, go downstairs for breakfast together, and then Matthew showers and gets ready to leave. But that meant he was leaving at 8:30, so not getting to work til 9. And apparently, other science dudes arrive at 9, but when 5 o'clock rolls around, those dudes are still working. And Hawkeye feels guilty about leaving before all the other little scientists. But who wants to get home right at their baby's witching hour? No one. So he hatched this great "plan" to get up and shower and be ready to go before Eliz wakes up, so he could get to work early, and leave early with no attached guilt. It sounds crazy, I know. So this morning, the alarm goes off at 6:30 am. Snoozed once. Then Hawkeye rolls out of bed, grabs his clothes and gets in the shower. Goes downstairs. Makes coffee and his breakfast. Jammy gets out of bed, kinda grumpy at being awake early. Goes downstairs. Drinks coffee. 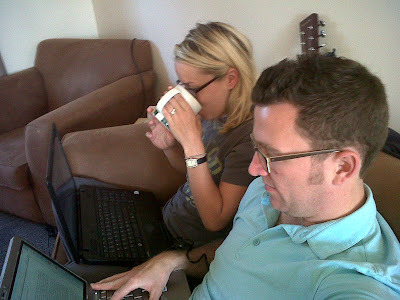 Hawkeye & Jammy have a little quiet time on the couch, drinking coffee and internetting. Then Hawkeye makes his lunch. Then packs his bag. Then unpacks his computer, and sits down on the couch and starts working. It is currently 8:25am, and Elizabeth is still snoring away up there. And Mummy and Daddy are both awake, and have been (unnecessarily?) for almost 2 hours. Plan: Fail.